Another traditional scrapbook layout I revamped yesterday and few more to come. I'm happy with the results and I think it will take several years before I get tired with it and revamp again. 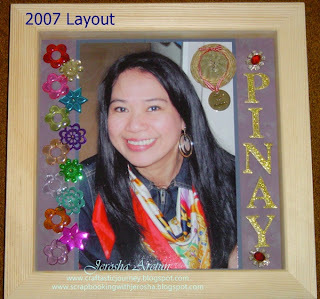 I mainly used Forever Young Cricut Cartridge ... used pastel glittered alpha chipboards and maintained the Pinay concept of my layout. With this previous LO I adhered acrylic jumbo flowers and jumbo sequins, a native hat and a pendant that says Världens Bästa Mamma (The Worlds' Best Mom) plus the diamond studded ruby earings my mom gave to me. can you imagine how limited my supplies when I started paper crafting? Through the years my craft room with all the goodies in it grew that I have to make another craft room down the basement. The woman with a handbag is a cut I made using Forever Young Cricut Cartridge =) I added a flower bling on the handbag and used pearlmaker at the center. Will do more revamping this day and tomorrow ... I think.